In nominating Nobel laureate Steven Chu for Secretary of Energy, Barack Obama may have selected the smartest man ever to run a cabinet department. Chu was born on February 28, 1948, in St. Louis, MO. His father, Ju Chin Chu, and his mother, Ching Chen Li, were both immigrants from China. Ju Chin Chu came to the United States in 1943 to continue his education in chemical engineering at the Massachusetts Institute of Technology. Two years later, Li joined him to study economics. Higher education has been a hallmark of Chu’s extended family. His mother’s grandfather earned advanced degrees in civil engineering at Cornell, and her great uncle studied physics at the Sorbonne under Jean Baptiste Perrin, winner of the 1926 Nobel Prize. According to Chu, “virtually all of our aunts and uncles had PhDs in science or engineering,” and his two brothers and four cousins collected three MDs, four PhDs and a law degree among them. Chu graduated from Garden City High School in St. Louis with an A-minus average, but was denied admission to Ivy League colleges. He received his AB in mathematics and BS in physics in 1970 from the University of Rochester, and his doctorate in physics from University of California, Berkeley in 1976. He remained at Berkeley as a postdoctoral researcher for two years before joining Bell Labs, where he and several co-workers delved into research that became known as laser cooling—a technique that allowed researchers to “slow down” subatomic particles in order to study them. 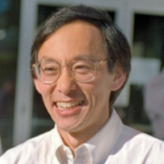 Chu left Bell Labs and became a professor of physics at Stanford University in 1987. He went on to serve as the chair of the physics department from 1990 to 1993 and from 1999 to 2001. Along with three other professors, Chu was involved with the Bio-X program at Stanford intended to bring together scientists from physics, chemistry, biology and engineering backgrounds under one roof in the James H. Clark Center. He also played an important role in securing the funding of the Kavli Institute for Particle Astrophysics and Cosmology at Stanford. In 1997, Chu was awarded the Nobel Prize in Physics along with Claude Cohen-Tannoudji and William D. Phillips for their work at Bell Laboratories developing methods to cool and trap atoms with laser light. In 2004, Chu was appointed the director of Lawrence Berkeley National Laboratory (LBNL), during which time he also accepted a position as a professor of physics at UC Berkeley. While running LBNL, Chu led a push to develop new technologies using biofuels and solar energy to help in the fight against global warming. In 2007, Chu was at the center of a heated controversy at Berkeley concerning his support of a deal with British Petroleum to provide partial funding for a new Energy Biosciences Institute that would grant the company unprecedented rights to the intellectual property it produces. Chu is the first cabinet member to have earned a Nobel Prize.